The Quietus | News | Mastodon: "Acid Is The Best Drug In The World"
Mastodon: "Acid Is The Best Drug In The World"
So I suppose we shouldn’t be too surprised to learn that Mastodon have been extolling the virtues of acid to Rolling Stone, telling the magazine they’ve been using the drug for inspiration since adolescence. The extract from the article, posted by Dosenation and due to run in the next issue of Rolling Stone, then claims that drummer Brann Dailor “tripped almost non-stop from the age of 14 until his early 20s” in an effort to escape an “operatically awful childhood”. “I went to high school on acid,” Dailor says. “Droppers filled with liquid acid on my tongue and just going for it, fully exiting what I consider to be an earthly plane. 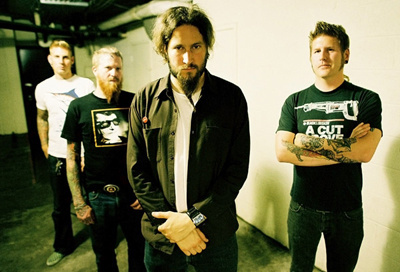 The band also claim that their lyrics (example – ‘Seabeast’ from 2004’s Leviathan: “Dear Mr. Queequeg you have been informed your life's been saved / You are not a black-hearted vicious mess so it has been claimed") are drafted after “doing too much” of the drug.